For the band, see Azimuth (band). For the airline, see Azimuth (airline). The azimuth is the angle formed between a reference direction (in this example north) and a line from the observer to a point of interest projected on the same plane as the reference direction orthogonal to the zenith. An azimuth (/ˈæzɪməθ/ ( listen); from Arabic اَلسُّمُوت‎ as-sumūt, “the directions”, the plural form of the Arabic noun السَّمْت as-samt, meaning "the direction") is an angular measurement in a spherical coordinate system. The vector from an observer (origin) to a point of interest is projected perpendicularly onto a reference plane; the angle between the projected vector and a reference vector on the reference plane is called the azimuth. When used as a celestial coordinate, the azimuth is the horizontal direction of a star or other astronomical object in the sky. The star is the point of interest, the reference plane is the local area (e.g. a circular area 5 km in radius at sea level) around an observer on Earth's surface, and the reference vector points to true north. The azimuth is the angle between the north vector and the star's vector on the horizontal plane. Azimuth is usually measured in degrees (°). The concept is used in navigation, astronomy, engineering, mapping, mining, and ballistics. Azimuth Marker, Mount Allen (Sandstone Peak), Southern California, USA. In land navigation, azimuth is usually denoted alpha, α, and defined as a horizontal angle measured clockwise from a north base line or meridian. Azimuth has also been more generally defined as a horizontal angle measured clockwise from any fixed reference plane or easily established base direction line. Today, the reference plane for an azimuth is typically true north, measured as a 0° azimuth, though other angular units (grad, mil) can be used. 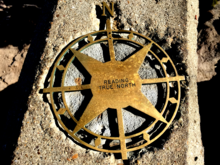 Moving clockwise on a 360 degree circle, east has azimuth 90°, south 180°, and west 270°. There are exceptions: some navigation systems use south as the reference vector. Any direction can be the reference vector, as long as it is clearly defined. Quite commonly, azimuths or compass bearings are stated in a system in which either north or south can be the zero, and the angle may be measured clockwise or anticlockwise from the zero. For example, a bearing might be described as "(from) south, (turn) thirty degrees (toward the) east" (the words in brackets are usually omitted), abbreviated "S30°E", which is the bearing 30 degrees in the eastward direction from south, i.e. the bearing 150 degrees clockwise from north. The reference direction, stated first, is always north or south, and the turning direction, stated last, is east or west. The directions are chosen so that the angle, stated between them, is positive, between zero and 90 degrees. If the bearing happens to be exactly in the direction of one of the cardinal points, a different notation, e.g. "due east", is used instead. Remark that the reference axes are swapped relative to the (counterclockwise) mathematical polar coordinate system and that the azimuth is clockwise relative to the north. This is the reason why the X and Y axis in the above formula are swapped. If the azimuth becomes negative, one can always add 360°. Caveat: Most computer libraries (C/C++, Python, Java, ...) reverse the order of the atan2 parameters. This is typically used in triangulation. 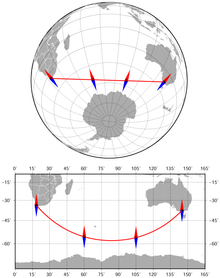 The azimuth between Cape Town and Melbourne along the geodesic (the shortest route) changes from 141° to 42°. Azimuthal orthographic projection and Miller cylindrical projection. A better approximation assumes the Earth is a slightly-squashed sphere (an oblate spheroid); azimuth then has at least two very slightly different meanings. Normal-section azimuth is the angle measured at our viewpoint by a theodolite whose axis is perpendicular to the surface of the spheroid; geodetic azimuth is the angle between north and the geodesic; that is, the shortest path on the surface of the spheroid from our viewpoint to Point 2. The difference is usually immeasurably small; if Point 2 is not more than 100 km away, the difference will not exceed 0.03 arc second. Various websites will calculate geodetic azimuth; e.g., GeoScience Australia site. Formulas for calculating geodetic azimuth are linked in the distance article. To calculate the azimuth of the sun or a star given its declination and hour angle at our location, we modify the formula for a spherical earth. Replace φ2 with declination and longitude difference with hour angle, and change the sign (since the hour angle is positive westward instead of east). There is a wide variety of azimuthal map projections. They all have the property that directions (the azimuths) from a central point are preserved. Some navigation systems use south as the reference plane. However, any direction can serve as the plane of reference, as long as it is clearly defined for everyone using that system. Used in celestial navigation, an azimuth is the direction of a celestial body from the observer. In astronomy, an azimuth is sometimes referred to as a bearing. In modern astronomy azimuth is nearly always measured from the north. (The article on coordinate systems, for example, uses a convention measuring from the south.) In former times, it was common to refer to azimuth from the south, as it was then zero at the same time that the hour angle of a star was zero. This assumes, however, that the star (upper) culminates in the south, which is only true if the star's declination is less than (i.e. further south than) the observer's latitude. If, instead of measuring from and along the horizon, the angles are measured from and along the celestial equator, the angles are called right ascension if referenced to the Vernal Equinox, or hour angle if referenced to the celestial meridian. In the horizontal coordinate system, used in celestial navigation and satellite dish installation, azimuth is one of the two coordinates. The other is altitude, sometimes called elevation above the horizon. See also: Sat finder. In mathematics, the azimuth angle of a point in cylindrical coordinates or spherical coordinates is the anticlockwise angle between the positive x-axis and the projection of the vector onto the xy-plane. The angle is the same as an angle in polar coordinates of the component of the vector in the xy-plane and is normally measured in radians rather than degrees. As well as measuring the angle differently, in mathematical applications theta, θ, is very often used to represent the azimuth rather than the representation of symbol phi φ. For magnetic tape drives, azimuth refers to the angle between the tape head(s) and tape. In sound localization experiments and literature, the azimuth refers to the angle the sound source makes compared to the imaginary straight line that is drawn from within the head through the area between the eyes. An azimuth thruster in shipbuilding is a propeller that can be rotated horizontally. The word azimuth is in all European languages today. It originates from medieval Arabic al-sumūt, pronounced as-sumūt in Arabic, meaning "the directions" (plural of Arabic al-samt = "the direction"). The Arabic word entered late medieval Latin in an astronomy context and in particular in the use of the Arabic version of the astrolabe astronomy instrument. The word's first record in English is in the 1390s in Treatise on the Astrolabe by Geoffrey Chaucer. The first known record in any Western language is in Spanish in the 1270s in an astronomy book that was largely derived from Arabic sources, the Libros del saber de astronomía commissioned by King Alfonso X of Castile. ^ "Azimuth" at New English Dictionary on Historical Principles; "azimut" at Centre National de Ressources Textuelles et Lexicales; "al-Samt" at Brill's Encyclopedia of Islam; "azimuth" at EnglishWordsOfArabicAncestry.wordpress.com Archived January 2, 2014, at the Wayback Machine. In Arabic the written al-sumūt is always pronounced as-sumūt (see pronunciation of "al-" in Arabic). Look up azimuth in Wiktionary, the free dictionary. "Azimuth" . Encyclopædia Britannica (11th ed.). 1911. "Azimuth" . Collier's New Encyclopedia. 1921.